Purchasing a car wash or building one from the ground up? Eastern Funding offers financing loans for these and other car wash products including equipment upgrades. 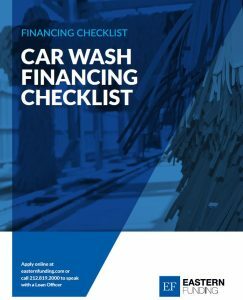 Download the free car wash financing checklist of what you’ll need to obtain financing for your car wash business. First,tell us about a little about your project by filling out the form below. Please enter a number from 10000 to 5000000.